Introduction to the ATTAC seminar The New Budgetary Discipline in the EU, Chair of Attac Finland, “Professor Heikki Patomäki discusses the current problems and future prospects of the European Union in his opening remarks to the seminar The New Budgetary Discipline in the EU”, organised by Attac, at the Visitor’s Centre of the Finnish Parliament. Published on 12 March 2012. “From the Eurocrisis to a Global New Deal: Interview with Heikki Patomaki” (openEconomy / openDemocracy interview published online in July 2013). “Professor Patomäki: ‘There are good reasons to expect that the neoliberal era is coming to an end’” (Eurocrisis in Press/LSE interview published online in August 2013). “From the ‘Social Dimension’ to European Social/Democracy and Beyond” (summary of my talk at the October 2013 conference organized by the European Commission). “Patomaki – Manifiesto por una Democracia Global PARIS”, presentación del Manifiesto por una Democracia Global 30 de Enero 2014 – Sciences Po de París. My talk in English, recorded at Science Po in Paris on 30 January 2014 (published 13.2.2014). “Grexit is not Good for the European Union as a Whole” (Interview for the Efimerida Ton Syntakton newspaper, Athens, Greece, published 17 April 2015). ”Contradictions of the EMU”, slides of the presentation on 4 May 2015 and related photos available of the European Economic and Social Council Public Hearing in Brussels, Belgium, entitled ”For a democratic and social EMU within the framework of the community method”. ”EU’s Neighbourhood Policy, Russia, and the Conflict in Ukraine”, presentation 10.12.2015 in the GUE-NGL conference ”PEACE in the southern and eastern neighbourhood” 10 & 11 December 2015 at the European Parliament in Brussels, Belgium. A written blog-version is available here. “On the Constitution of Corporate Power: What Is to Be Done?”, presentation 20.2.2016 at the Plan B conference in Madrid, Spain, workshop 1: How to regulate transnational corporations, put an end to fraud, tax havens, and the power of lobbies?. “Climate Change and its Effects on Global Industrial Civilization: What’s Next?”, a joint interview 7.10.2016 with Graciela Chichilnisky and Heikki Patomaki, interviewed by Marcus Rolle and C.J. Polychroniou, Global Policy. “A Common European Corporate Tax: Political and Policy Considerations”, slides of a presentation in a workshop of the S&D group of the European Parliament on 7 March 2017. 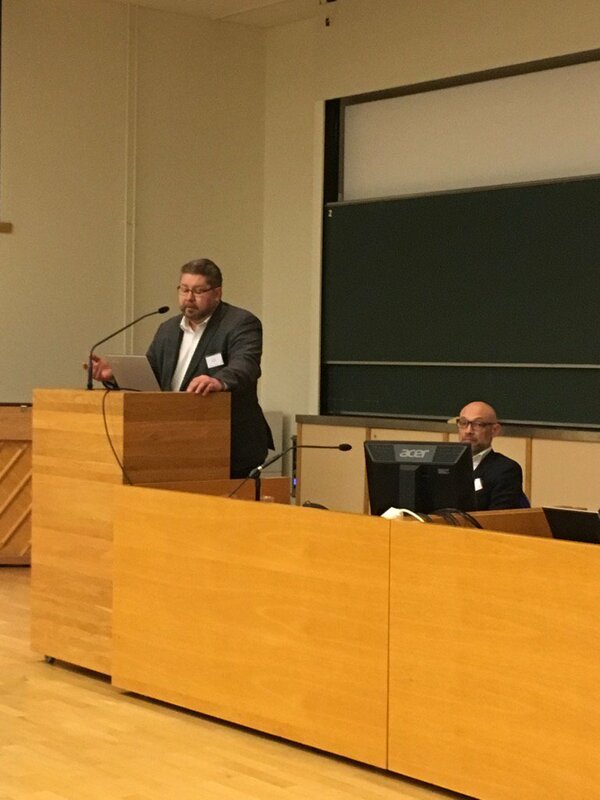 “Commodification in Higher Education: The Old University Law of 2009 and the New University Law 2020”, slides of a presentation in the plenary panel of the Annual Conference of the Finnish Political Science Association in Jyväskylä on 9 March 2017 (summarising the key arguments of a recent book I co-authored with three colleagues from Law, Economics and Medicine respectively). Here is also a photo of the occasion. “Common Budget and the Future of the EU”, slides of my presentation at the “Building the Progressive Future Together” event organized by the S&D group in the European Parliament, at the Square “Golden Hall”, Brussels, on 18-19 October 2017 (workshop “Financial solutions for a new budget and a new Europe”, chaired by Isabelle Thomas, S&D Group Vice-President). “On the Conditions of Social Europe: Upward Convergence, Full Fiscal Capacity and Social Redistribution”, slides of the presentation at the “Social Union in Europe” event in Budapest (Kossuth Klub) organized by Millennium Intézet & Friedrich-Ebert-Stiftung Budapest, on 30 November 2017. “The World in a State of Disintegration?”, an Interview 10.4.2018 by C. J. Polychroniou, Global Policy and other e-media.